How do I set up a Hitch Standard in the EasyMatch QC software? To set up a Hitch Standard in the EasyMatch QC software you will first need to read in a Standard. Once you have read in the standard select the standard, right click, and select properties. A new window will now open. On the right hand side of the window will be a Hitch button; click it and a new window will open. This window is called ‘Hitch Readings to Standard’ and displays all of the properties of the Hitch. This window shows the Hitch Method and Hitch Type. The Hitch Method allows you to choose between a Tristimulus Hitch (using color values) and a Spectral Hitch (using spectral values.) A Tristimulus Hitch is done using 3 color values whereas a Spectral Hitch is generally done using at least 31 data points. The window also shows the Color Conditions including color scale, illuminant, and observer. If you are using a Tristimulus Hitch you will need to specify these color conditions. Along the bottom of the hitch window the ‘as read’ values of the standard are shown, as well as the target values. Enter your desired values in the target values boxes. To save all changes in the Hitch Readings to Standard window click OK. In the Hitch Readings to Standard window there is also an option to temporarily disable the hitch. When you check this box the hitch will essentially be turned off. If you wish to turn the hitch back on you can simply navigate back to the Hitch window and uncheck the box. 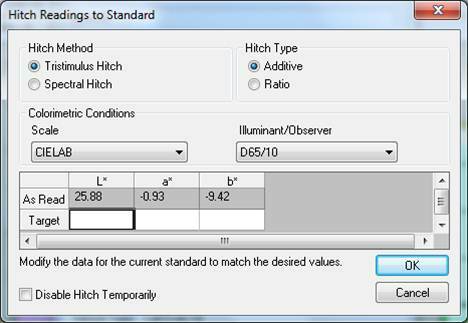 If at any time you wish to change your target values, you can navigate to the ‘Hitch Readings to Standard’ window and simply change the values in the Target values box.